This morning as I was blissfully brushing my teeth with my spectacular Sonicare toothbrush, my fingers decided to become lazy (I think I was half asleep) and they let go. Much to my dismay it bounced off my leg with bristles merrily dancing, ricocheted off the tub onto my shin then hit the floor. For those of you wondering what is so wrong with that, I have one word. Toothpaste. Yes, this is my toothbrush…the Macro Photography group I belong to on Flikr.com ran a contest featuring plastic. This was one of my entries. Yes, I admit I'm crazy not only to have taken the photo, but actually posted it online…twice. The foamy toothpaste had splattered all the way down my navy slacks. At first I thought I‘d use a damp towel to rub it off, sometimes delusional people think this works, I of course knew it wouldn’t but hoped anyway. As the minutes ticked by, my dark pants began to look like they’d been airbrushed with white paint. Damp towels a no-go, I tossed them into the dirty clothes basket. Out came my black pants, good thing I had a pair waiting in the wings. Don’t block the box. The first time I came to The City, I was frightened by some of the intersections, more correctly, just the ones with lines crisscrossing them. Later I learned the true meaning behind the lines. Don’t Block the Box. 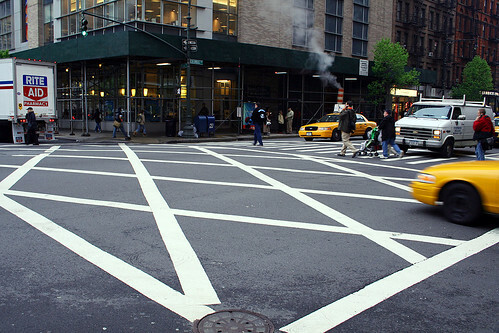 These helpful stripes are there to remind vehicle operators not to block the intersection. If you think, “Oh, I’ll just squeeze over there, or run the light,” and you don’t actually make it out of the intersection before the light turns, you might end up with a big fat ticket. Oh, and don’t honk either. Sure, you’ll feel better, but the poor pedestrian standing next to your car is now deaf. Hey, I guess you get a new replaceable head for your toothbrush today because I sure wouldn't want to put it back in my mouth. I know what you mean about the toothpaste "spot"--especially on dark clothing. I've noticed them there on myself several times after I'm "sure" I've cleaned up ok. The boys constantly loose their toothbrushes and so I've stopped buying expensive ones. Wal-mart sells the kid ones 2/$1 and I stock up everytime I go. We recently discovered a new hiding spot for flossers. Under the couch cushions--Yuk! Time to firm up the expectations. I told them I would charge them for every new toothbrush they loose from now on. (Unless they can actually keep track of one for a whole month). Cross your fingers this works. LOL! Oh that's great! Good luck with that!